Can You Eat Pears at Night to Lose Weight? Perhaps you've heard that eating late at night and eating carbohydrates at night are detrimental to weight loss. As pears are a carbohydrate-based food, this may lead you to think that you shouldn't eat them before bed, but this isn't the case. Pears can be part of a healthy, before-bed snack if you're on a weight loss diet. One medium pear, weighing 178 grams, contains roughly 100 calories. Weight loss boils down to calories in versus calories out. Over the course of each day, you need to consistently consume fewer calories than you burn to lose weight. This is known as a calorie deficit. Provided a pear fits into your calorie allowance, you can eat one without fear of gaining weight -- whether you eat it at night or any other time. 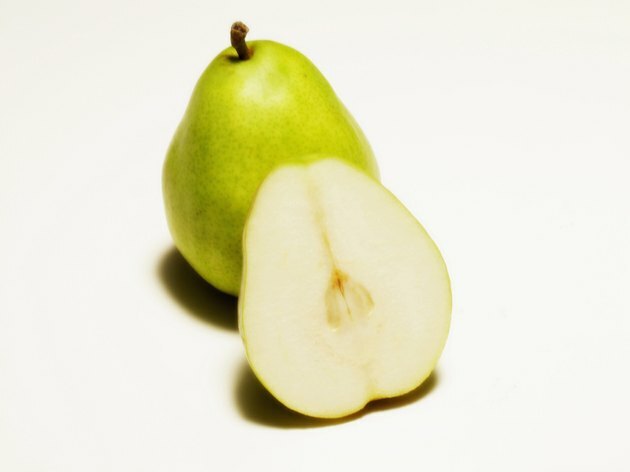 Pears are packed full of fiber with around 6 grams per medium fruit. This can be a help when it comes to weight loss. Fiber slows digestion and adds bulk to help make you feel full. It also helps keep your blood sugar levels stable by delaying the absorption of sugars into your bloodstream. Some people believe that if you are trying to lose weight, you shouldn't eat after a certain time in the evening. However, your body doesn't care what time you eat. Any calories not burned off before going to be will be used the next day, notes research dietitian Mary Flynn, Ph.D. in an article on the Real Simple website. Pick fresh pears for your before-bed snack, as pears canned in syrup have a lot less fiber at only 2 grams per 126-gram serving, as well as added sugar. While theoretically, you could eat pears with anything that fits your calorie allowance before bed, a light, lower-calorie snack may be a better choice. Try chopping some pears and mixing them into low-fat Greek yogurt, or poaching a pear in water and serving it with a few nuts and berries, or simply crunching on a fresh, juicy pear while unwinding after a long day.